This month the table tennis playing brothers Nima and Noshad Alamian were sent to Hong Kong to compete in the Asia Cup. Their teammate Neda Shahsavari, the first Iranian female table tennis player to compete at an Olympic level, heard a day before her flight she was not allowed to go to the competition. The authorities did not want her to travel as the only woman in the sports caravan. 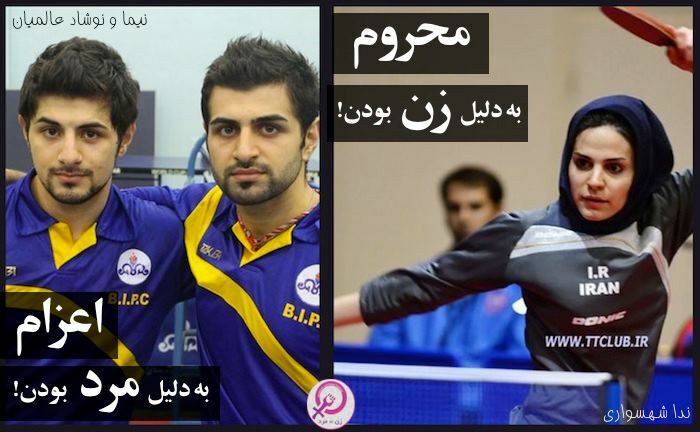 Source: the Persian Female = Male Facebook page. In Saudi Arabia the United Arab Emirates stand at an annual cultural festival was raided by religious police. Three of the men were deported from the country because the religious police thought they were too handsome, and the visiting women might fall in love with them. It is not clear if the raid was connected to another raid by a single member of the religious police who, according to a statement by the UAE stand, was attracted by the presence of an Emirati-Egyptian singer Aryam. The UAE stand stressed the singer was there by coincidence and had no intention of singing.